This software is ideal for those family historians, genealogical socities, individuals and genealogists looking for a very easy way to publish cemetery transcriptions. The software will create an indexed book with a picture of each monument, from the cemetery transcription database. CemToPictureBOOK converts CemEditor databases into fully indexed books with a photo for each entry. The original release will allow 10 entries per page with the following information: Name, Birth, Death, Aged, Section, Lot, Row, and Stone. Additional information that will not fit on the page with the pictures will be place in alphabetical order in an appendix. The program will compile single or multiple cemeteries into an "DOC" (Rich Text) Microsoft Word - word processing file. Rich text files can be opened by many other word processing programs, however, due to the complex formatting in the document the free WordPad program, included with windows, will not display the document properly. Once opened in Microsoft Word the document can be printed or converted to an Adobe PDF file by using the FREE PrimoPDF virtual printer. The PrimoPDF is very easy to setup and use and you can make PDF files from any file that can be printed. View sample output in PDF format. The sample is a small cemetery with about 36 individual entries. The table of contents and appendix was excluded from the sample. If you a already have the information entered in a program that can export as CSV you can import it directly into the CemEditor and then create pages using the CemToPictureBOOK. CSV is a format many popular word processors, databases and spreadsheets can save or export to. To publish a single cemetery open a database and click-on - "Make Book". 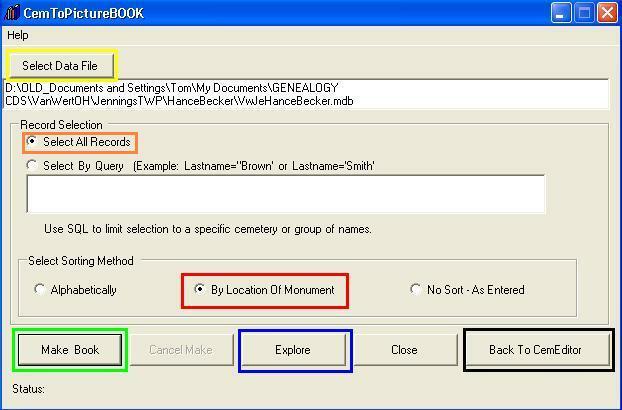 To publish multiple cemeteries into a single book the CemEditor can be used to import several cemeteries into a single database. After import select the database and click on "Make Book". This program will process, on most computers, at speeds above 60 to 90 records per minute. Single or multiple cemeteries in one book. Creates a cemetery information page for each cemetery. Creates a master index, for both single and multiple cemeteries. Prints cemetery name and page number at the top of each page. The CemToPictureBOOK software license to you or your organization. At least 3MB of free space on hard drive. CemToPictureBOOK only. (You must already have a copy of the CemEditor) See requirements.